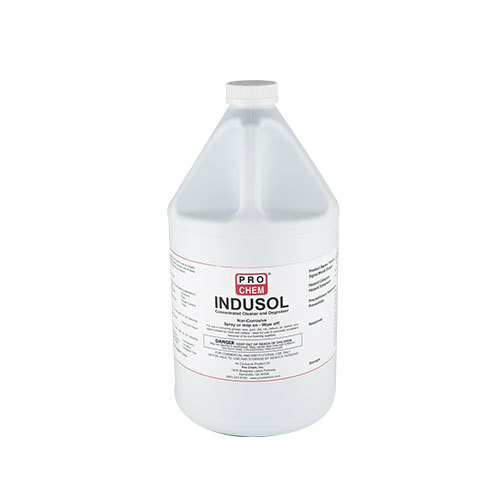 Indusol | Pro Chem, Inc.
INDUSOL is a concentrated, water-based, butyl cleaner/degreaser that is safe to use on virtually any surface not harmed by water. It has the ability to penetrate, absorb, emulsify and lift away grease, oil, gum, dirt, wax, carbon, ink, and stains, yet never leaves an oily residue. It is intended for use as a general cleaning agent on all surfaces, or for use with steam or mechanical cleaning devices in all departments of official establishments operating under the Federal meat, poultry, shell egg grading and egg products inspection programs where there is no possibility of food contact in food processing and food handling establishments. Because of its low foaming properties, it may be used in automatic scrubbers. Note: not recommended for use on galvanized steel. Must be thoroughly rinsed. Do not use concentrate on water-based paint, composition floors or aluminum.